Groupon And Living Social Are "Gorillas Among Ants"
While the daily deals space is increasingly crowded, Groupon and LivingSocial are "Gorillas among ants," says comScore. According to comScore these top two players account for 90% of the visits to daily deals sites. It's good for Groupon and LivingSocial, but over time a bunch of "ants" can become problematic. 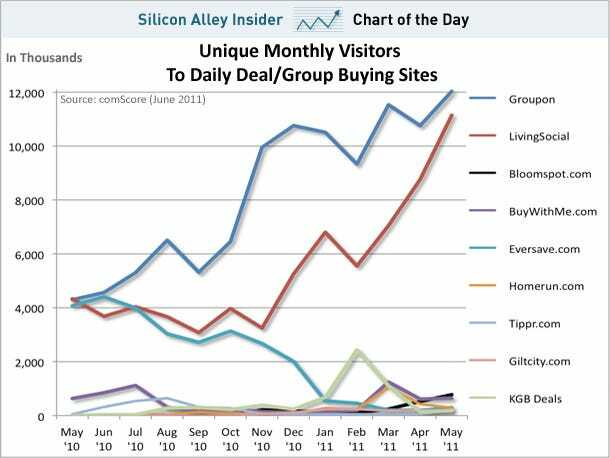 As the "ants" get more and more daily deals for themselves, it will affect Groupon and LivingSocial. That's why both companies are shifting to a real time model offering multiple deals in a limited time frame. That's a much more difficult model emulate.